At Southeast Floor Prep our licensed and professional Florida concrete diamond grinding and polishing specialists can serve any concrete needs you may have. Southeast Floor Prep has prided itself in having the best team, technology and equipment to provide the best floor possible. The same equipment used in the preparation of concrete for coating installation is also incorporate in the polishing process. Southeast Floor Prep has prepared concrete floors for coating application for a variety of businesses including restaurant kitchens, distribution plants and parking structures. Concrete diamond grinding and polishing is becoming a popular flooring finish for most concrete floor owners that have new or existing concrete floors. Polished concrete comes with many advantages such as cost efficiency, durability and low maintenance which makes this type of flooring suitable for commercial and industrial flooring as well. The experts at Southeast Floor Prep use the diamond grinding and concrete polishing process to ensure the most professional results.Then, diamond-embedded abrasive pads are used to buff and polish the floor until it sparkles. Once this has been completed you can maintain the beautiful appearance and increase its durability. If you are using concrete as the base material for kitchen or bathroom counter-tops, for example, the objective is to create an attractive, custom design that stands out above the typical tile, Formica or even granite surface. But even a well crafted counter-top that has not been given a proper concrete polishing can look amateurish. By taking this final step, your counter top can make the leap from run of the mill acceptable to show place blue ribbon prize winner. When it comes to floors for the home, office or business, concrete polishing can help you save money while providing a very practical surface for all these venues. Why unnecessarily spend thousands of dollars installing tile or wood laminate or carpet over a perfectly good surface? With a well chosen acid stain and a little polishing, you can turn even the drab, washed out looking floor into a vibrant, exciting topic of conversation. The cost of renting equipment or even paying for the job is far less than what you would pay for flooring materials, not to mention labor costs. Plus, a nicely diamond polished concrete floor in your Florida showroom or outlet is far more interesting than a bland, neutral color carpet. Take the same approach with your garage floor if you so desire. Many specialty car owners or small business owners that use their garage as a work shop can give this area a real lift with a once over lightly with concrete polishing equipment. Again, a little stain and polishing will transform the appearance and feel of a standard garage into a classy and professional looking workshop or showroom. Diamond polished concrete is becoming extremely popular in South Florida lately as it is beautiful and shiny yet functional and easy to clean. Diamond Grinded and Polished concrete floors are not only cost effective and durable, but don’t require extensive ongoing maintenance. Concrete polishing is a great option for revitalizing garage floors, industrial facilities, new tenant floor finishing, retail and grocery. There are also homeowners that use our concrete grinding and polishing service for a basement, garage, shop floor or commercial space. Floors can be polished up to the desired level of sheen. You also get increased hardness, and ultimate durability. With this sheen many people as if they are slick. 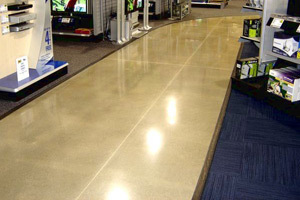 Polished concrete is less slippery than waxed linoleum or marble…Plus, major retailers wouldn’t be using it if they didn’t think it would be safe for their customers. We would like to have the opportunity to view your surface and talk about what diamond polishing concrete can do for you. At Southeast Floor Prep, our expert South Florida concrete diamond grinding and polishing professionals will perform your concrete grinding flawlessly. We are different from most concrete grinding companies you may have heard of in that we are dedicated to provide you with professionally resurfaced concrete that looks better than new without the need for completely replacing your driveway, concrete floors, patio or other concrete surfaces. Our professionals can handle any stone restoration or concrete polishing job that you may need for your South Florida home. The experts at Southeast Floor Prep offer everything from floor preparation to extensive industrial restoration projects in excess of 100,000 sq ft any where in the South Florida area. If you are looking for a Concrete Diamond Grinding Company in South Florida then please call toll free at 1-877-GRINDFLOOR (1-877-474-6335) or locally at 561-748-7754 or complete our online request form.